Our full-service jewelry store sells all the latest trends in diamond necklace, like the diamond pendant necklace style, as well as various gold chain styles and more. Whether you love classic looks or more elaborate necklaces, we have the perfect necklace you’ve been looking for! With over thirty three years experience in jewelry and necklaces, we bring our customers the best jewelry education and top-notch service throughout Monmouth, Middlesex and Ocean County in New Jersey. We carry the largest selection of necklaces in the latest styles. If you’re looking for a gold chain style or a diamond necklace, let us walk you through our selection to find the perfect necklace you’ve been looking for. Are you harboring a special design and looking to create custom necklaces that no one else will ever have worn? 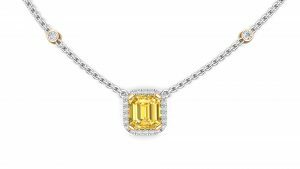 Let our expert jewelers work with you step by step to create a gorgeous high-grade diamond pendant necklace or whatever your imagination longs for! With the latest in CAD/CAM and 3-D printing technology, we can custom design any necklace for you in gold, platinum and set with any stone! From conception to reality, we work one-on-one with our customers making any adjustments, from style to fit to create an amazing gold chain necklace or any other range of styles! Call 732-536-1184 or visit us today in the Towne Pointe Shopping Center in Manalapan New Jersey off Route 9 South.